This long-awaited English translation and critical edition of The Divine Farmer's Classic of Materia Medica by well-known medical historian and translator Dr. Sabine Wilms is a product of her triple engagement with the worlds of applied Chinese medicine, academic sinology, and sustainable agriculture. The 365 substances covered are categorized in three books, associated with Heaven, Humanity, and Earth respectively. Coming from the perspective of alchemy and the pursuit of health and longevity, treating disease and expelling pathogens by ingesting substances that have a strong directly-discernible effect on the body is viewed as the lowest goal. By contrast, the higher-ranked medicinals often have no discernible effect when ingested, but especially when taken over long periods of time have such ambitious and intangible goals as connecting the human spirit to heaven, lightening the body, or staving off aging. The information contained in this book and the vision of the world and of the effect of natural substances on the human body expressed here are bound to inspire any practitioner of the Chinese art of yǎngshēng 養生 ("nurturing life"). - 50 pages of prefatory matters, including a foreword by Dr. Eugene Anderson and a preface and introduction by Sabine Wilms. - 469 pages of text in both classical Chinese and contemporary English. - A critical edition of the Chinese source text, based on the leading current Chinese editions and incorporating philological, etymological, and archaeological findings. - A literal yet elegant translation into English, crafted with careful attention to different possibilities inherent in the classical Chinese but also to readability, to reflect the elegance of the original. - A crisp clear layout, featuring the Chinese text immediately above the English translation in a structure that makes cross-referencing easy even for a beginning student of medical Chinese. Click this link for a sample of two minerals from Book Two. - Endnotes that discuss such diverse topics as medicinal identification, grammar questions, and character variations, based on extensive research in historical and contemporary commentaries. - Explanations of ancient disease names on the basis of classical medical texts, most notably Sūn Sīmiǎo's 孫思邈 Bèi Jí Qiān Jīn Yào Fāng 備急千金要方 and Cháo Yuánfāng's 巢元方 Zhū Bìng Yuán Hòu Lùn 諸病源候論. - References to modern clinical TCM, for example in regards to the usage of medicinals and disease names. - A glossary with explanations for diseases, an index of both historical and contemporary references, and a general index. The publication of Sabine Wilms' translation of the Shén Nóng Běn Cǎo Jīng (神農本草經) marked the beginning of a truly remarkable year for classical Chinese medicine. As Z'ev Rosenberg noted in his review that appears on the author's website: 'we are now in an era where the core medical texts, the Han dynasty medical classics, are being released in defi nitive, clear versions with more accurate terminology' (http://www.happygoatproductions.com/ blog/2016/2/22/impressions-of-the-shnnng- bnco-jng-by-zev-rosenberg). And what a year it has been. In addition to the publication of the present work, 2016 has seen the publication of Paul Unschuld's Líng Shū (靈樞) translation and his newly revised edition of Nán Jīng (難經). Dr. Wilms' translation of the seminal text of Chinese herbalism has been prepared with care and exacting scholarship. The translation is clear, and Wilms— an accomplished scholar, translator and teacher of Chinese medicine—has included several noteworthy sections in addition to the translation that will be discussed in more detail below. At 650 pages, the text is bound in a compact form that can easily be transported to the clinic, the classroom or the fi eld. Those who have the earlier Blue Poppy translation by Yang Shou-zhong should certainly consider investing in Wilms' translation, because the scholarship is a cut above the former. Fifteen illustrations (12 sketches and three block prints) compliment the translation nicely and provide the reader with an important reminder that Chinese herbalism transcends the written word. The layout of the text is useful, evincing the care that Dr. Wilms has put into this work. The Table of Contents includes a page reference for each medicinal, and there are multiple indices (Pinyin, Latin and general) that make searching the text quite effortless. Personally, I always found searching for a particular medicinal in the Blue Poppy edition to be a chore, so I particularly appreciate this aspect of the text. The addition of a glossary in which key terms are elaborated on and elucidated, as well as the inclusion of the Chinese characters for each entry, should please even the most discriminating scholar. A Foreword by Dr. Eugene Anderson introduces the text, providing a basic introduction to its history and background, as well as delving into a brief comparison between Chinese and Western herbal medicine. The Foreword is followed by a Preface written by the author herself, in which she details her relationship with and intention for her translation, before embarking on a thorough history of the text, its various iterations, and its status as the preeminent běn cǎo (本草) of Chinese medicine. The introductory material concludes with a section in which Wilms discusses the challenges presented by the identifi cation of medicinal substances and the translation of certain terms. The translated text begins with the Preface to the Shén Nóng Běn Cǎo Jīng (神 農本草經), which gives brief descriptions of the categorisation system used, herbal theory (including taste, temperature and formulation guidelines), instructions for administration, and categories of illness. 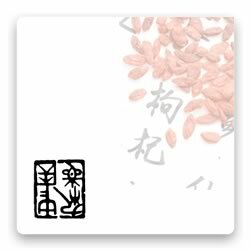 Following the Preface are the descriptions of individual medicinals, which are organised into upper (上), middle (中) and lower (下) classifi cations, and further categorised as herbs (草), trees (木), food crops (穀), rocks (石) and insects (蟲). Each medicinal has its own page, and this layout allows the reader to truly focus on their individual descriptions. Wilms has wisely included the Chinese characters for each entry—a decision that is likely to be appreciated by scholars of Chinese medicine, or students who want to hone their translation skills. Wilms' translation—as to be expected— is clean and elegant. Each medicinal has its pinyin name, an English translation of the pinyin, the Latin name, alternative Chinese names, taste and temperature, followed by the translation of the entry. Let us take a look at her translation of Rén Shēn (人參) as an example: 'Indicated for supplementing the fi ve zàng organs, calming the essence spirit(s) and calming the hún and pė souls, stopping fright palpitations, expelling evil qď, brightening the eyes, and opening up the heart and boosting wisdom. Consumed over a long time, it lightens the body and extends the years. Grows in mountain valleys.' (Wilms, p. 18) Compare this to Yang Shou-zhong's translation from the Blue Poppy edition: 'It mainly supplements the fi ve viscera. It quiets the essence spirit, settles the ethereal and corporeal souls, checks fright palpitations, eliminates evil qi, brightens the eyes, opens the heart, and sharpens the wits. Protracted taking may make the body light and prolong life ... it grows in mountains and valleys.' (Yang, p. 24-25) At face value, these two translations may appear to be quite similar, but it is the subtle differences—leaving hún and pò untranslated, for instance—that make Wilms' translation a better pedagogical and clinical tool. In my own practice, the Shén Nóng Běn Cǎo Jīng (神農本草經) is a source of inspiration when I am deciding between several herbs that all seem like reasonable choices for inclusion in a formula. It is invaluable for fi nding those more obscure uses of an herb that do not appear in our modern materia medica textbooks, and often provides unique insights into herb actions/indications that are not found elsewhere. From a teaching perspective, the Shén Nóng Běn Cǎo Jīng (神農本草經) is an essential supplement to any herbal curriculum, and gives students a window into a more ancient understanding of the herbs and their uses. I can also imagine a role for this text—particularly the author's Preface and the Preface to the book itself—in a class on the history of Chinese medicine. There is little to gripe about with this work but, if I could make one request, it would be that Dr. Wilms publish a companion volume with commentaries on the herbs from various scholars. Wilms mentions in her Preface that she purposefully avoided adding commentaries, with the intention of 'let[ting] the ancient classic speak for itself as faithfully to the original as possible' (Wilms, xlii). While this stance is certainly understandable, I can only hope that her playful statement, 'There is always time for another book in the future ...' (Wilms, xlii) presages a companion volume in the near future. All things considered, Wilms has produced the definitive translation of this classic of Chinese herbalism. Serious scholars, herbalists, students, teachers and clinicians with an interest in classical Chinese medicine will certainly want to add her translation of the Shén Nóng Běn Cǎo Jīng (神農本草經) to their library.